Hello, we are very excited to share our Sampaguita Home with you on AIrbnb! The Sampaguita is the national flower of the Philippines (also known as the Arabian Jasmine) and holds special meaning to property owner Anjanette who was born and raised in the Philippines. As a child she has fond memories of the fragrant scent of the flower which grew at her grandmother’s home. Anjanette studied nursing in the Philippines and moved to Michigan in 1996 after marrying her husband Frank. Frank grew up in Michigan and graduated with a B.B.A. in Business Computer Systems. We moved to North Carolina in 2004 to enjoy the warmer weather and bluer skies. Anjanette received her Realtor's license in 2016 and we have been passionate about the real estate business ever since! Our motto is "work hard but don't forget to stop and take a breather and get some much needed rest and relaxation". If you book with us we will go "out of the way" to make your Airbnb experience as pleasant as can be! This property is located in a very quiet part of Durham that is home to many retired people who take great pride in keeping their home and land looking nice. Also, the streets are well lit at night. The property is within minutes of the American Tobacco Trail, a paved twenty plus mile trail that leads into downtown Durham (about 5 to 6 miles to downtown from property). This property will not accommodate 8 adults - 6 adults is the maximum allowed. If there are 8 people in your group then 2 must be children. Please note that there are two single fold-out beds for them. This is a beautiful home in a quiet part of Durham. It was close to restaurants, stores, and all that we needed. The home was new and clean. We'd happily stay here again! White glove clean, super cute decor, fabulously equipped and located in a safe neighborhood close to everywhere we were going and everything we needed! Definitely would stay here again! The house was very clean and well maintained. It had an open floor plan which we loved. The location was close to the airport and stores. We would use again and recommend to others. We enjoyed our stay. The home is very clean and beds are comfortable. The kitchen and gas stove are in excellent condition. It was a great home away from home for our visit to Durham. We would stay there again! This was a very comfortable, clean home with complete kitchen and comfortable beds. Our stay here was very pleasant and we would choose to stay at this home again. The owners provided excellent customer service. 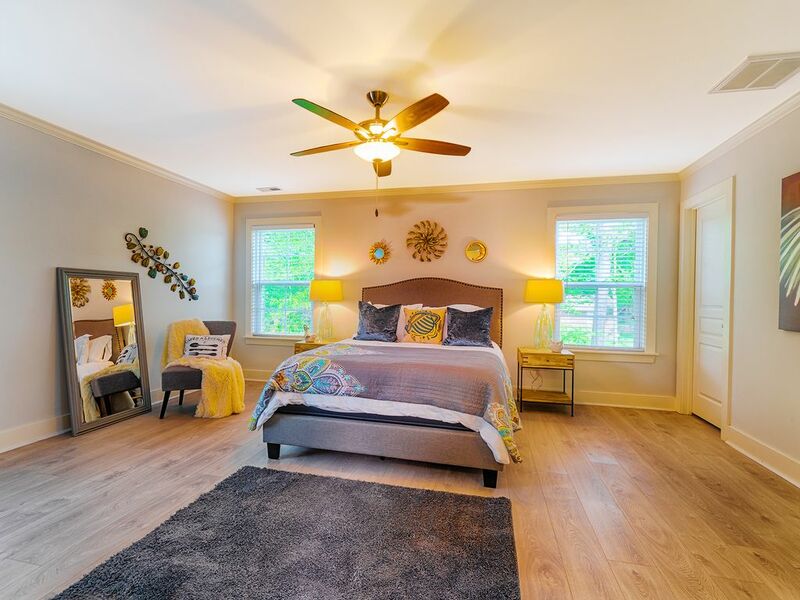 The home is located on the corner of a quiet neighborhood street and a busy street so there is some traffic noise that can be heard in the master bedroom which is why I gave it 4 of 5 stars. My husband and I preferred to sleep in the second bedroom with a queen bed because it was quiet on that end of the house. Overall this is an excellent place to stay while in the Durham area. We recently stayed in Durham for 3 nights while touring the graduate program at University of NC at Chapel Hill with our daughter, and checking out the area where she would be living if she attends the school there. This home was perfect in every way! Beautifully decorated with all the amenities we needed (& then some), and a great kitchen to cook in, supplied with all the necessary cookware to make our own meals. The beds were so comfortable (even met my husband's difficult standards). My husband commented as we drove away that I did good finding that home, and if we return, we won't have to look elsewhere! It was hard to leave such a beautiful home to return to drive back to Ohio.